Provide comfort for the family of David Selezinka with a meaningful gesture of sympathy. 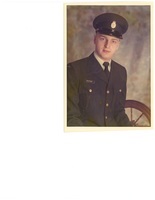 On Friday, March 15, 2019 David Robert Selezinka of Myrnam, Alberta passed away at the age of 63 years. David will be forever loved by his mother: Anne Thomas of Glendon; as well as numerous aunts, uncles & cousins. David was predeceased by his brother: Jim Selezinka; step-father: Merle Thomas; maternal grandparents: John & Evelyn Niedzielski. Service of Remembrance, Monday, March 25, 2019 at 11:00 a.m. at the Glendon Pentecostal Church, Glendon, AB with Pastor Terry Luciow. In lieu of flowers, memorial tributes in memory of David may be sent to the charity of one's choice.